Boxed kits and a package of refill clay. About a year ago I discovered some cute clay modelling kits from Japan, called “Fuwa Fuwa.” (In Japanese “fuwa fuwa” means something like “very soft.”) They follow in the tradition of cute miniature foods… which can be used in “deco-ing.” The kits include some clay, molds, glue, and rhinestones & other embellishments. The clay in these kits is something like paper / foam clay, which is extremely lightweight and air dried. While the clay is still moist, it smells a tiny bit, but that goes away once it dries. Some of the kits come with a special “mousse” clay which is very soft and can actually be pipped just like frosting. If you use up all the clay that comes in the kit, you can also buy extra clay (the normal bricks or the mousse clay). It comes in a several different colors, including pastels colors, “chocolate” colors, white, and even some “sparkly” colors. 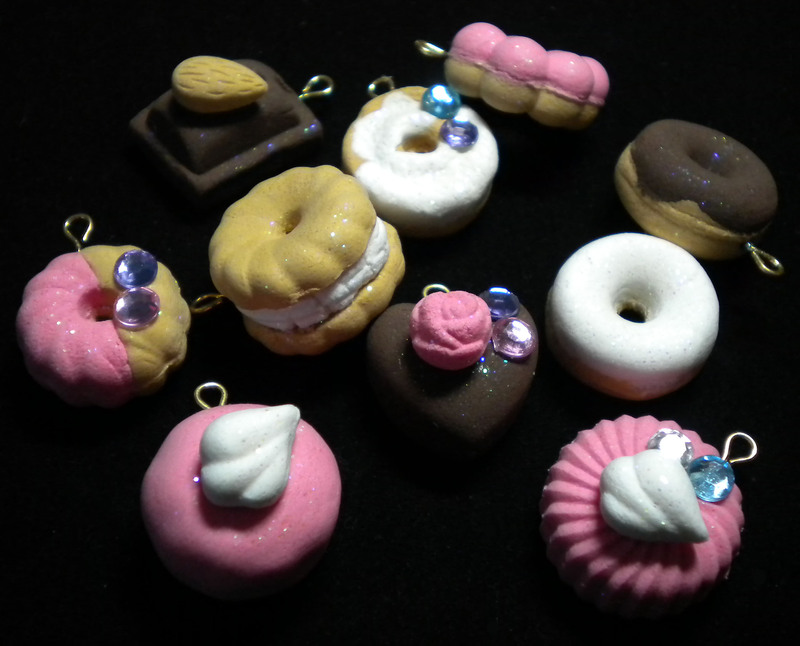 The kits have different themes like: chocolates, doughnuts, deli, ice cream, etc… The first kit I bought was for making miniature sweets to use as charms / cabs. It included the eyepins, charm loops, and even a ball chain necklace. It even included a bonus antique key plastic charm. Although the instructions are in Japanese, there are illustrations – not to mention that its pretty easy to figure out how to use the kits in general: put clay in mold, remove excess, carefully take out of mold, arrange pieces and glue together, allow to dry, and voila! – you have a cute mini doughnut, cookie, or whatever. The only annoying part was that the molds often leave seams – although you can work these out if you are willing to take the time to do it (in the picture below, you can see that I did NOT take the time to do this with all of the charms in the first batch I made, lol). After having used up all the clay in my first kit, I thought it might be fun to get another couple of kits to make different things. I mistakenly assumed that all the kits made charm-sized items – which is not true at all. In fact, the last time I looked at etsy (which is where I bought my kits – in the “supplies” section), most of the fuwa fuwa kits make larger items. So please pay close attention when you’re choosing a kit. I suppose that its fairly obvious that these kits are aimed at a younger audience, but I like them because they are so easy. Sitting and playing with the clay – pressing it into the mold, putting the pieces together – these are great stress relieving activities, in my opinion. Perfect for a day when I want to make something, but I’m feeling a little too tired to be super creative. I played with these a lot while I was studying for my comprehensive exams last spring! 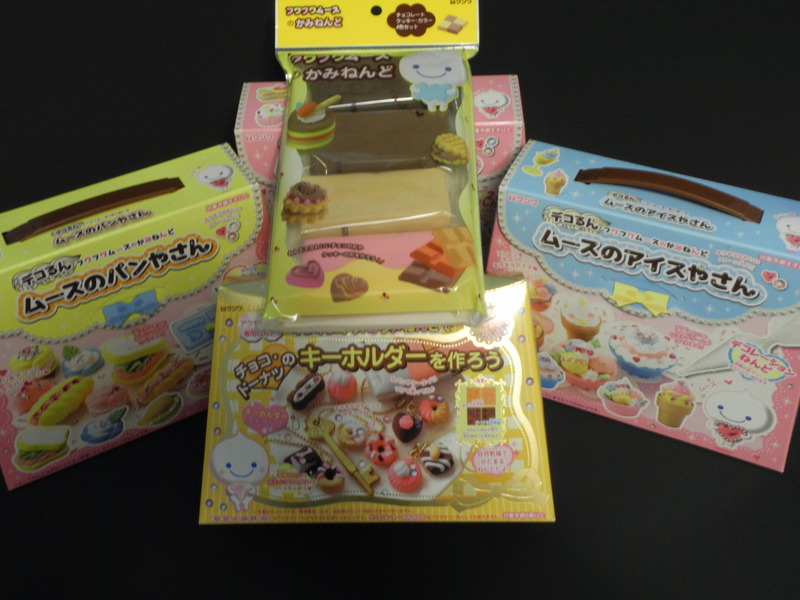 Also these kits might be a good starting point for someone who wants to get into making mini-foods – later you can graduate to making them without molds! I love sweets deco-den. I haven’t purchased any of the Japanese kits yet–just stock up on polymer clays and air dry clays at the craft stores Stateside. I held off on molds for the longest, but finally gave in on a french macaroon one a few months ago. It’s just a really fun hobby to have, isn’t it?